Here, I decided to mix Twitter user accounts with hashtags. To keep things manageable, I took only the accounts we identified as journalists that posted at least 300 tweets between February 15 and April 15 from the 25K accounts we follow. For every one of those accounts, I queried our database for the 10 hashtags most often tweeted by the user. I then filtered the graph to show only hashtags used by at least two users. I was finally left with 512 user accounts (the turquoise nodes, size is number of tweets) and 535 hashtags (the red nodes, size is frequency of use). Link strength represents the frequency with which a user tweeted a hashtag. 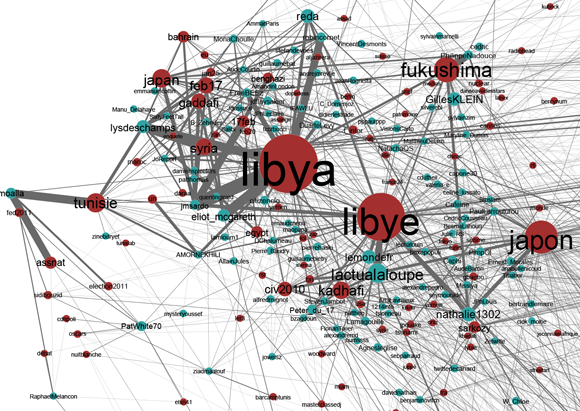 What we get, is still a thematic map (libya, the regional elections, and japan being the main topics), but this time, we also see, which users were most strongly attached to these topics. 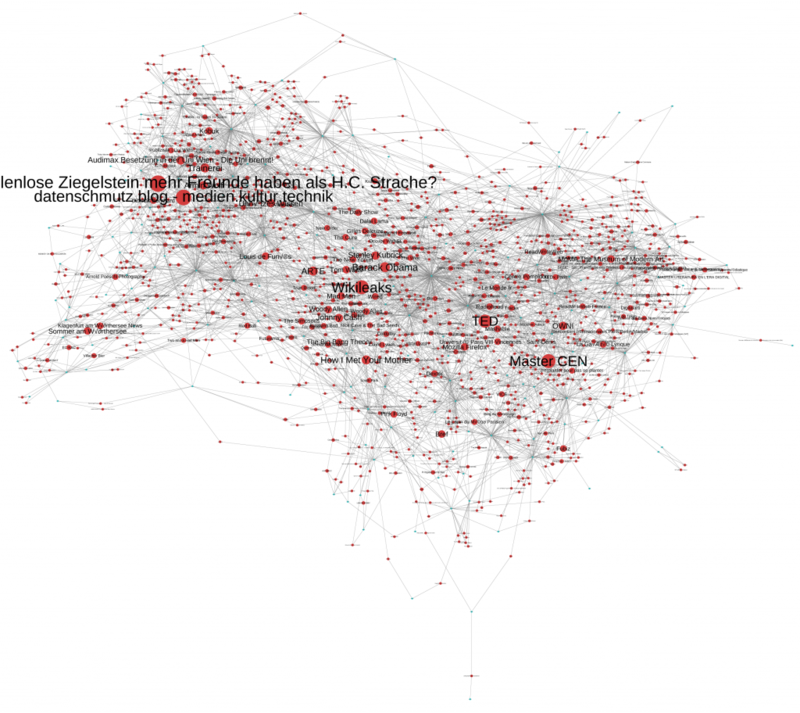 Mapping heterogeneous units opens up many new ways to explore data. The next step I will try to work out is using mentions and retweets to identify not only the level of interest that certain accounts accord to certain topics (which you can see in the map above), but the level of echo that an account produces in relation to a certain topic. We’ll see how that goes. The Association of Internet Researchers (AOIR) is an important venue if you’re interested in, like the name indicates, Internet research. But it is also a good primary source if one wants to inquire into how and why people study the Internet, which aspects of it, etc. 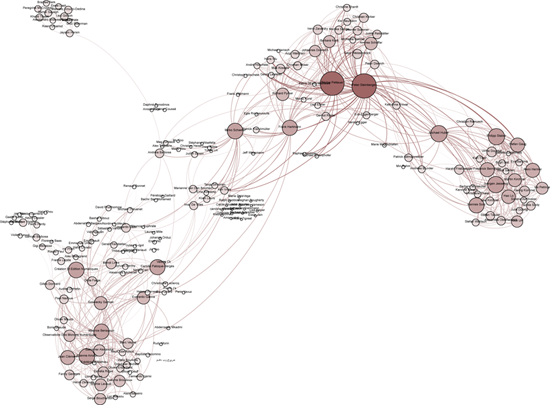 Conveniently for the lazy empirical researcher that I am, the AOIR has an archive of its mailing-list, which has about 22K mails posted by 3K addresses, enough for a little playing around with the impatient person’s tool, the algorithm. 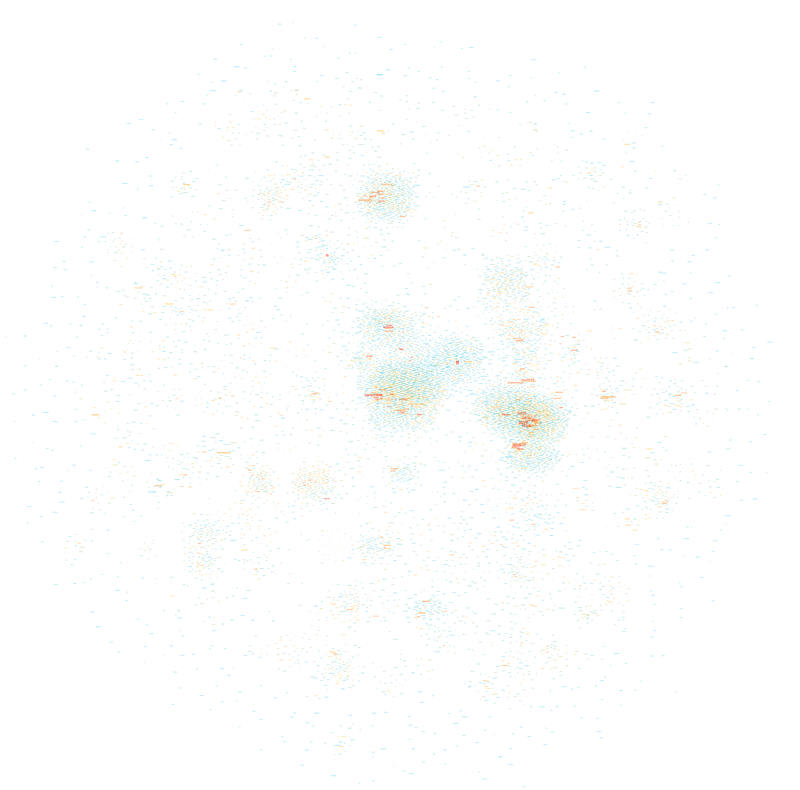 I have downloaded the data and I hope I can motivate some of my students to build something interesting with it, but I just had to put it into gephi right away. 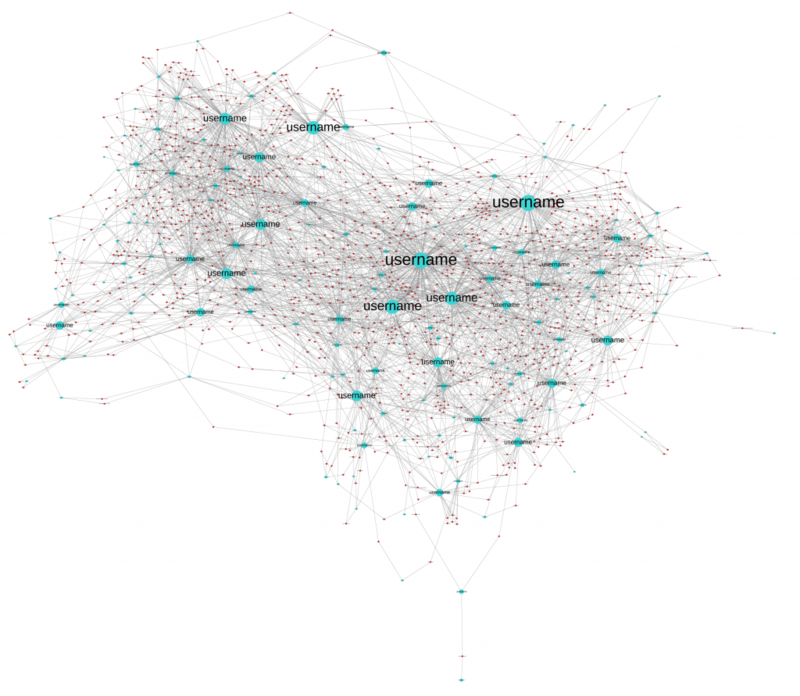 Some of the tools we’ll hopefully build will concentrate more on text mining but using an address as a node and a mail-reply relationship as a link, one can easily build a social graph. So, these are the air-l posters with more than 60 messages posted since 2001. 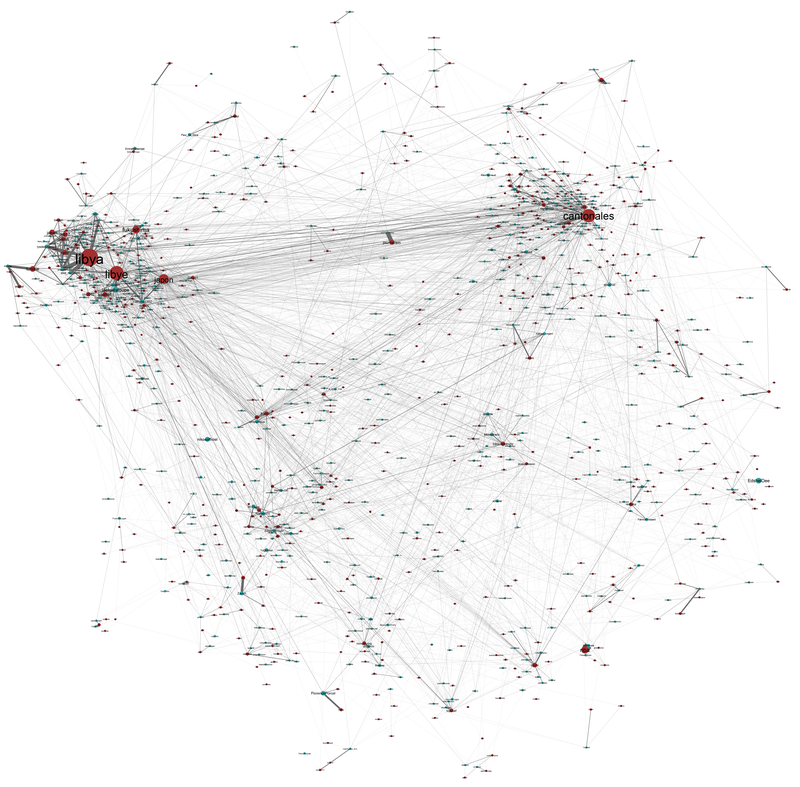 Node size indicates the number of posts, a node’s color (from blue to red) shows its connectivity in the graph (click on the image to see a much larger version). Link strength, i.e. number of replies between two people, is taken into account. You can download the full .gdf here. The only difference between the four graphs is the layout algorithm used (Force Atlas, Force Atlas with attraction distribution, Yifan Hu, and Fruchterman Reingold). You can instantly notice that Yifan Hu pushes nodes with low link count much more strongly to the periphery than the others, while Fruchterman Reingold as always keeps its symmetrical sphere shape, suggesting a more harmonious picture than the rest. Force Atlas’ attraction distribution feature will try to differentiate between hubs and authorities, pushing the former to the periphery while keeping the latter in the center; just compare Barry Wellman’s position over the different graphs. I’ll probably repeat this experiment with a more segmented graph, but I think this already shows that layout algorithms are not just innocently rendering a graph readable. Every method puts some features of the graph to the forefront and the capacity for critical reading is as important as the willingness for “critical use” that does not gloss over the differences in tools used. When it comes to search interfaces, there are a lot of good ideas out there, but there is also a lot of potential for further experimentation. Search APIs are a great field for experimentation as they allow developers to play around with advanced functionality without forcing them to work on a heavy backend structure. 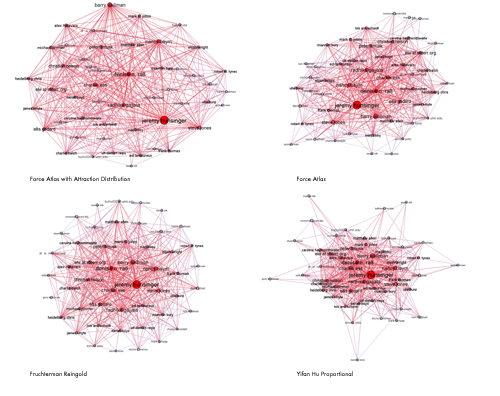 Since I have started to play around with the latest (and really great, easy to use) version of the gephi graph visualization and analysis platform, I have developed an obsession to build .gdf output (.gdf is a graph description format that you can open with gephi) into everything I come across. The latest addition is a Facebook application called netvizz that creates a .gdf file describing either your personal network or the groups you are a member of. Update 2: netvizz currently only works with http and not https. I will try to move the app to a different server ASAP. Winter holidays and finally a little bit of time to dive into research and writing. After giving a talk at the Deep Search conference in Vienna last month (videos available here), I’ve been working on the paper for the conference book, which should come out sometime next year. The question is still “democratizing search” and the subject is really growing on me, especially since I started to read more on political theory and the different interpretations of democracy that are out there. But more on that some other time. One of the vectors of making search more productive in the framework of liberal democracy is to think about search not merely as the fasted way to get from a query to a Web page, but to think about how modern technologies might help in providing an overview on the complex landscape of a topic. I have always thought that clusty – a metasearcher that takes results from Live, Ask, DMOZ, and other sources and organizes them in thematic clusters – does a really good job in that respect. If you search for “globalisation”, the first ten clusters are: Economic, Research, Resources, Anti-globalisation, Definition, Democracy, Management, Impact, Economist-Economics, Human. Clicking on a cluster will bring you the results that clusty’s algorithms judge as pertinent for the term in question. Very often, just looking on the clusters gives you a really good idea of what the topic is about and instead of just homing in on the first result, the search process itself might have taught you something. I’ve been playing around with Yahoo BOSS for one of the programming classes I teach and I’ve come up with a simple application that follows a similar principle. TermCloud Search (edit: I really would like to work on this some more and the name SearchCloud was already taken, so I changed it…) is a small browser-based app that uses the “keyterms” (a list of keywords the system provides you with for every URL found) feature of Yahoo BOSS to generate a tagcloud for every search you make. It takes 250 results and lets the user navigate these results by clicking on a keyword. The whole thing is really just a quick hack but it shows how easy it is to add such “overview” features to Web search. 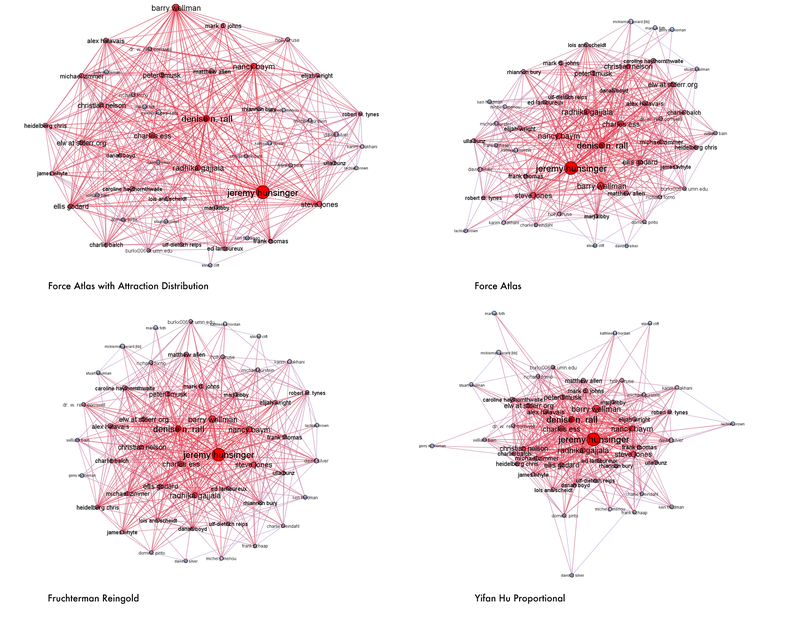 Just try querying “globalisation” and look at the cloud – although it’s just extracted keywords, a representation of the topic and its complexity does emerge at least somewhat. I’ll certainly explore this line of experimentation over the next months, jQuery is making the whole API thing really fun, so stay tuned. For the moment I’m kind of fascinated by the possibilities and by imagining search as a pedagogical process, not just a somewhat inconvenient stage in accessing content that has to be speeded up by personalization and such. Search can become in itself a knowledge producing (not just knowledge finding) activity by which we may explore a subject on a more general level.